If you love your golf just as much as we do it's very likely you know all about the 16th hole at TPC Scottsdale. 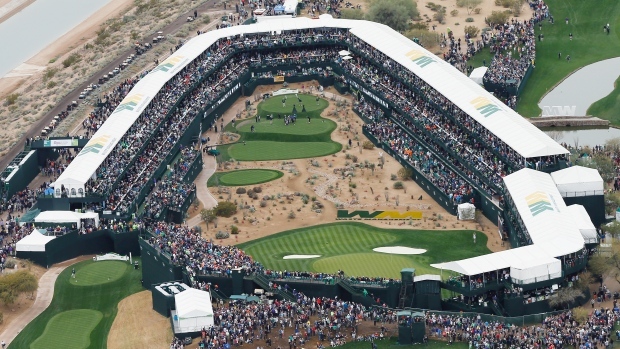 The antepenultimate hole at the Waste Management Phoenix Open's annual host venue is probably the loudest golf hole in the entire game. With jam-packed grandstands encircling the players as they stand on the tee, whether they hit a good shot or bad will soon become evident from the chorus of cheers or boos. Possibly Tiger Woods' most famous non-major golf shot came at the 1997 Phoenix open as the then 21-year-old scored a stunning ace in front of a raucous crowd. The watching galleries showered him with beer and goodness knows what else, as the man of the moment celebrated wildly. Francesco Molinari has always been a likeable sort, but his popularity level was never higher than after his dominant performance at the 2018 Ryder Cup where he sent thousands of European fans into raptures. Almost 20 years after Eldrick 'Tiger' Woods bagged a hole in one on the 16th at TPC Scottsdale, a Robot named in his honour managed the very same feat in front of open-mouthed golf fans. Though to be fair, it was his fifth attempt. We can't list all the great shots throughout the years on the 16th hole at TPC Scottsdale without mentioning the first ever. That accolade goes to the American golfer Hal Sutton who wrote himself into the history books back in 1988. Then known simply as the Phoenix Open, Sutton managed what no other man had up to that point during his third round. Sadly the golfing world had to mourn the loss of the Australian golfer Jarrod Lyle back in August of last year. Chief among some of the great memories he left us all was a stunning hole-in-one at the 2011 Waste Management Phoenix Open. When arriving at last year's Waste Management Phoenix open, Kentuckian Justin Thomas would have been feeling pretty good about his game. He managed to capture a maiden major title just a few months prior during the 2017 PGA Championship at Quail Hollow and he sat firmly inside the world's top five in the Official World Golf Rankings. It's no wonder then that he would go so tantalisingly close to an ace on the courses Stadium Hole. And As An Added Bonus... Caddie Racing! !